Another guarantee-busing leg of the GUKPT 25/25 Series is in the book after Dan Clark took the honours in the first event staged on Welsh soil. Clark topped an impressive field in Cardiff and turned his £200 investment into almost £10,000. After working their way through a final table that included Vaidas Siriunas, Diane Evans, Sophie Rigalia, Huan Wang and Robert Thomas, the final trio agreed a chop. Clark claimed the largest chunk of it, bagging a score of £9,500 with Tony Martin and Stephen Kavanagh both taking home £7,345 apiece. There's not long to wait until the next 25/25 action. The Reading leg runs from 19-22 February with the first of three opening flights starting at 7pm on Thursday followed by further days ones at 7pm on Friday and 4pm on Saturday. The buy-in is once again £200 with another £25,000 prize pool guaranteed. 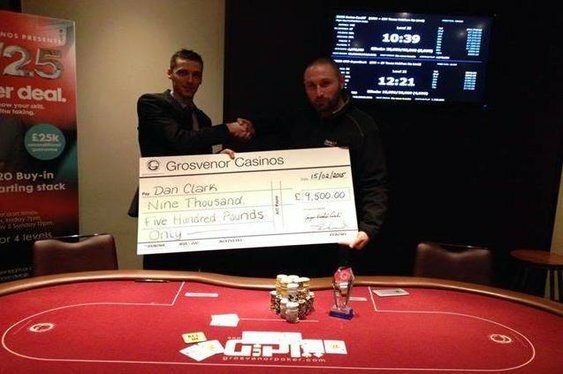 Qualify for GUKPT 25/25 events online at Grosvenor Poker.